On 13 June 2017 Dira Sengwe recognised the contribution of my late wife, Dr Mariëtte Botes, to the struggle for a proper response to HIV/AIDS by naming her as the recipient of the bi-annual Dira Sengwe Leadership in AIDS Award. I accepted the award on her behalf at the 8th SA AIDS Conference in Durban. 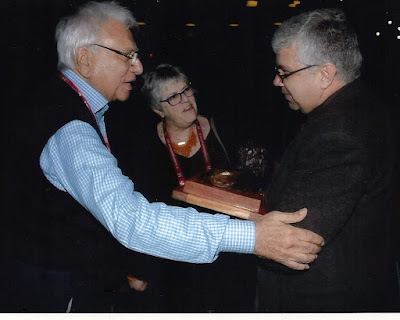 According to Prof Jerry Coovadia, chairperson of Dira Sengwe, the Leadership Award was instituted "in order to recognize exceptional contributions by individuals or organizations in the country in the response to the HIV epidemic." Dira Sengwe ("take action") is an NGO formed by the organising committee of the XIIIth International AIDS Conference which was held in Durban in 2000. This was at a time when the South African president publicly doubted that HIV was the cause of AIDS and his minister of health advocated the use of natural remedies, such as African beetroot and garlic as cures for those who were ill. The year 2000 was seminal year in South African medicine. Predident Mbeki's speech at the International Conference was inspired by his doubts. He also convened his infamous AIDS Panel that boosted the egos of the HIV/AIDS denialists who were invited. These denialists now had official "recognition" as members of Mbeki's AIDS Panel. Scientists and doctors responded with the well-known Durban Declaration that affirmed the scientific findings about a causal links between HIV and AIDS. In the public sphere the battle between NGOs (notably the Treatment Action Campaign and the AIDS Law Project) on the one side and government on the orther began, with puclic rallies and court cases being the most prominent manifestations of these battles. Around 2002 government faced enough pressure to reluctantly begin a change of policies, but it was only after the recall of President Mbeki in 2008 and President Mohlantle's immediate decision to appoint a new minister of health that government's policy changed effectively. A decade was lost during which thousands of people unnecessarily died from AIDS-related conditions and a next generation was born with HIV transmitted from mother to child. One of Dira Sengwe's primary goals is to record the history of this particular struggle and remember its heroes. In the mid-1990s an HIV/AIDS diagnosis implied death (except for a few with access to wealth). Most doctors preferred to avoid such incurable illnesses. However, a handful of pioneers realised that the role of the medical practitioner is not necessarily to cure; a terminal illness does not mean that quality of life should be abandoned. While AIDS was terminal, the associated medical conditions could indeed be treated in a manner that extended quality life for as long as possible. In the eraly years these pioneers began treating HIV+ patients symptomatically, with quality of life as an explicit goal - which also happened to extend life in many cases. More and more antiretrovirals were being developed, but costs of such medications were prohibitive. Mariëtte was one of those pioneers who did what she could for those who needed it. 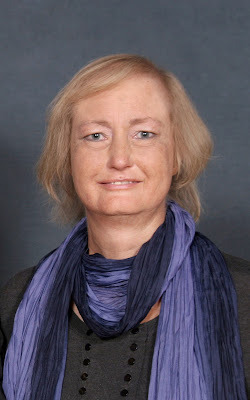 Mariëtte succeeded in participating in these trials, which provided access for patients at the Immunology Clinic of Kalafong Hospital in Pretoria under the auspices of the University of Pretoria. Providing access was already a significant achievement, given the official climate at the time. However, the personal price she would have to pay only emerged later. Who hatched the plan and why the various participants became involved in the plot that was to evolve, will probably never be answered in full. However, the aim of the plot was clear: discredit a proper medical response to the pandemic. 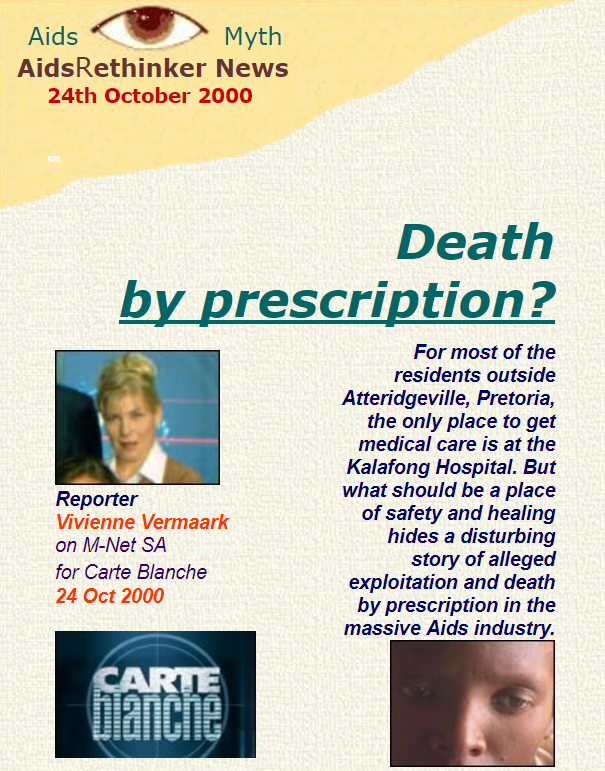 A certain Vivienne Vermaak, who was a producer for MNET's national current affairs TV programme, Carte Blanche, was also a self-proclaimed HIV denialist who posted her views on the (so called) HIV dissident fora. She also previously produced programs based on her convictions for Carte Blanche. At some point she started filming her new project. In parallel, a vociferous politician was approached who quickly concluded that "a nest of abuse and exploitation" was uncovered by this politician at Kalafong Hospital. She who proceeded to inform the press accordingly. Somewhat later the Carte Blanche programme was flighted. In modern parlance it would be described as a masterpiece of fake news. A complaint about the fabricated Carte Blanche story at the Broadcasting Complaints Commission of South Africa eventually led to a retraction broadcast by Carte Blanche. MNET was, however, adamant that they could not be forced to apologise for their actions. I wrote a letter that debunked the entire programme. However, MNET's lawyers soon indicated their "wish" that I should refrain from distributing the letter further and expected me to send retractions to those to whom the letter had already been sent. When I protested that I could prove every claim I made in my letter, their response was brief: It does not matter. Unable to fight a team of corporate lawyers I had to comply. The result is that Carte Blanche's fake news report is still freely available on the Internet, while my critique was successfully suppressed. News headlines continued to intermittently report on the "abuse". The University of Pretoria, afraid that its image might be tarnished, convened two commissions of enquiry. The first was an internal investigation that found no irregularities and confirmed that the correct procedures and ethics standards were followed at all times. However, the University also realised that an internal report would not be of much use if the University was accused of any irregularities. 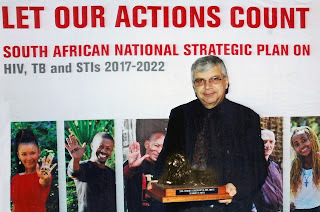 A second investigation was therefore commissioned - this time to be conducted by respected Prof Sas Strauss from Unisa. This investigation also found that the particular study was conducted in a professional manner following the widely accepted international ethics standards for such studies. However, in an interesting twist, the University realised that it (the University) was not mentioned in the newspaper stories and decided not to become involved in a public manner. Mariëtte was therefore left to fend for herself. Mariëtte often joked that she was "rescued" by the Hansie Cronje cricket match fixing scandal, which, in the year 2000, ended her term as the source of "scandal" in newspaper reports. However, the end of newspaper reports was not the end of the saga. A biography of politician, Patricia de Lille was published in 2002. It listed De Lille's role in "exposing" the clinical trial as one of her important achievements as a politician. In particular it named various patients which it claimed complained about their treatment as participants in the now infamous clinical trial at the Immunology Clinic at Kalafong Hospital, which obviously revealed the implicit HIV positive status of these individuals to the world at large. Some of these individuals became victims of abuse in their communities after this. Three women, in particular, wanted their names removed from the book to minimise further abuse. They were referred to the legal aid clinic of the University of Pretoria, which was initially eager to assist. However, De Lille, the author and publisher of the biography defended the publication of the names on the fact that the office of the Registrar of the University of Pretoria provided Vivienne Vermaak - a journalist - with a copy of Prof Strauss's report. From this they inferred that the names were released to the press, and could therefore be published freely. For the Legal Aid Clinic this signalled a conflict of interest and they withdrew their assistance from those who claimed to have been harmed by the publication of their names. 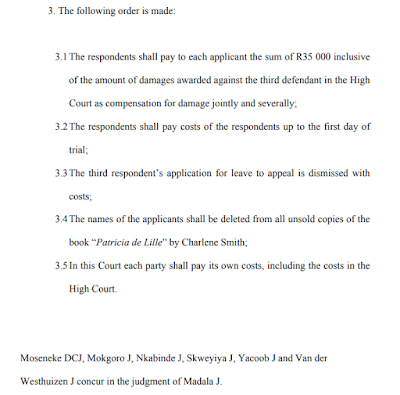 The complaint was then referred to the Aids Law Project (ALP), which was based at the University of the Witwatersrand. The ALP sought relief on behalf of the complainants, and eventually the case was heard in the (then) Johannesburg High Court. 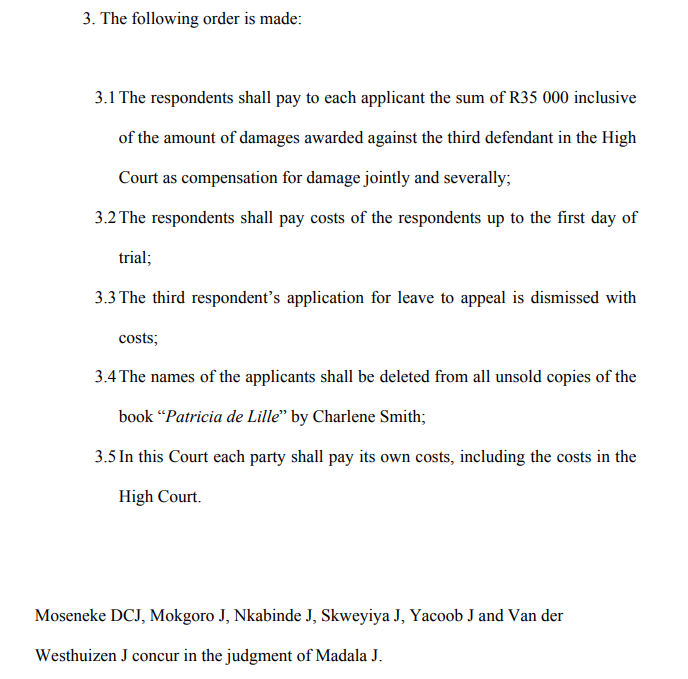 This court accepted the defence's grounds for publication of the names. 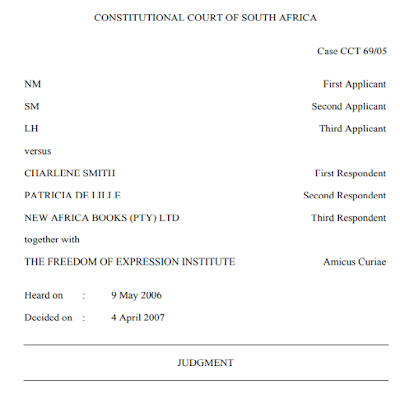 Permission to appeal was refused by the High Court and was also later refused by the Court of Appeals in Bloemfontein. Eventually the Constitutional Court granted leave to appeal. The highest court in the land at long last found that that the right to privacy of the complainants was indeed infringed, ordered the removal of their names from all unsold copies of the book and awarded a modest monetary amount for damages to the complainants. 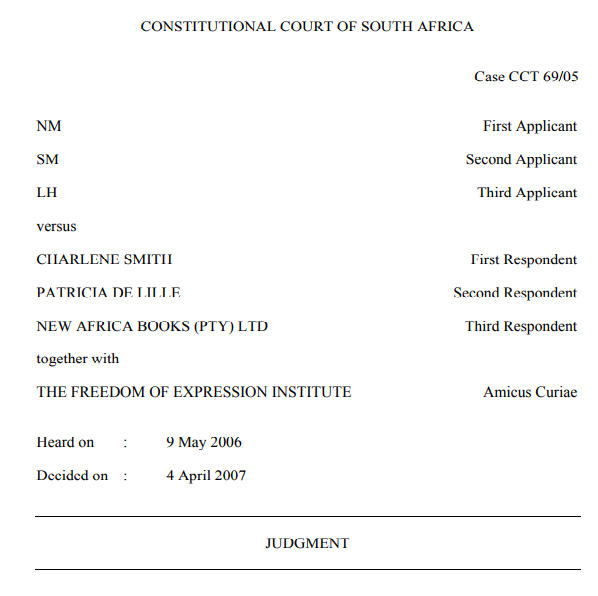 Seven years had passed since De Lille initially accused Mariëtte from abusing patients until the Constitutional Court ruled that De Lille, the author and the publisher of the biography had infringed the rights of those whom De Lille claimed to represent. While this entire saga continued for seven years, Mariëtte did not linger while waiting for it to conclude. In the ALP she found a reliable and respected new ally. Over the many years that followed her initial discussions with the ALP, she did not hesitate to refer matters to the ALP where the rights of HIV-positive patients were infringed - and a call from the ALP to the relevant medical fund, employer or other offending party typically immediately resolved the matter in the patients' favour. In fact, the need to call the ALP was in most cases replaced by just mentioning that she would refer a specific matter to them. Over time she became one of the authoritative voices on the treatment of HIV. She became involved in drafting treatment guidelines, was employed by medical aids to help decide complex treatment questions and acted as expert witness in HIV-related court cases. There was clearly no question that she fought the battle on the side of HIV-positive patients every day and everywhere. Despite these significant (and sometimes visible) activities, what I experienced as her most important role became clear almost every time we went shopping. Almost always some patient recognised her and introduced her to his or her friends, colleagues or family members. In the vast majority of such introductions she was introduced by the patient as "the doctor who saved my life." It is fitting that Dira Sengwe recognises the difference made by someone who most often fought it on a daily basis in the trenches. Mariëtte passed away on 24 February 2017. Today, 24 July, five months after that tragic day, is another suitable opportunity to celebrate her achievements. 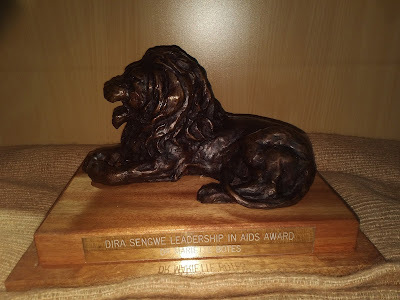 It is a fitting day for a post about the Dira Sengwe Award, even though the award was made six weeks ago.